Casey Whittier, KCAI ceramics alumni, is with us this semester teaching a brand new elective course entitled This is Place: Connecting Ceramics, Culture and Community.Using historical and contemporary sculpting techniques in clay, the course takes a holistic approach to exploring the broad meanings and implications of place through individual and collaborative projects. 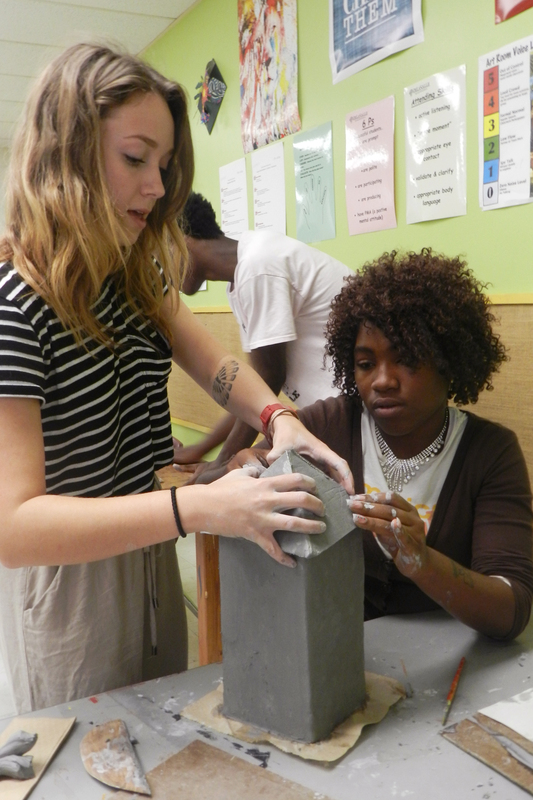 Through a partnership with DeLaSalle Education Center, KCAI students are working closely high school ceramics classes,through which students will have the unique opportunity to make work for permanent installation in or on DeLaSalle School grounds. 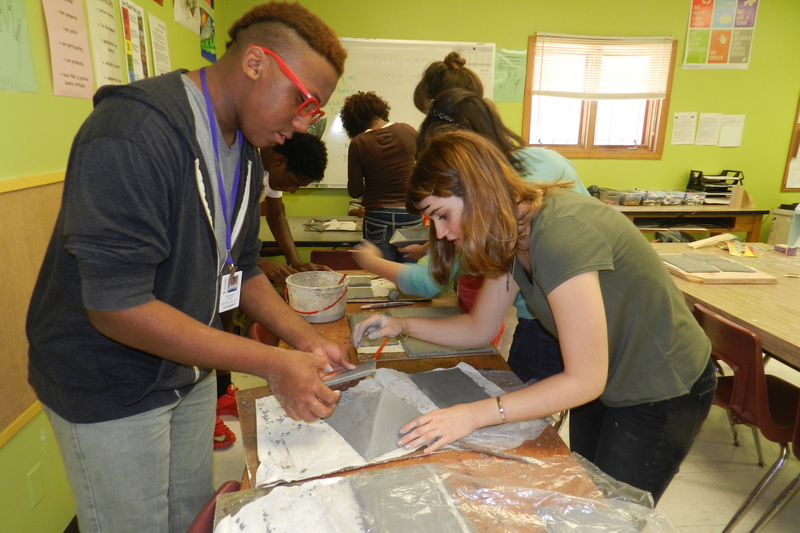 The partnership includes class time with the students at DeLaSalle, during which projects inspired by the KCAI students are worked on and completed. One of such projects included ceramic bird houses, inspired by historical architecture along Troost St. where many of the DeLaSalle Students live. The goal was to get the kids thinking about what constitutes a home, and how to extend help to others. The bird houses where created as collaborative projects in groups of 2, with KCAI students helping with building techniques, and were measured to accommodate birds after installation on the DeLaSalle campus. 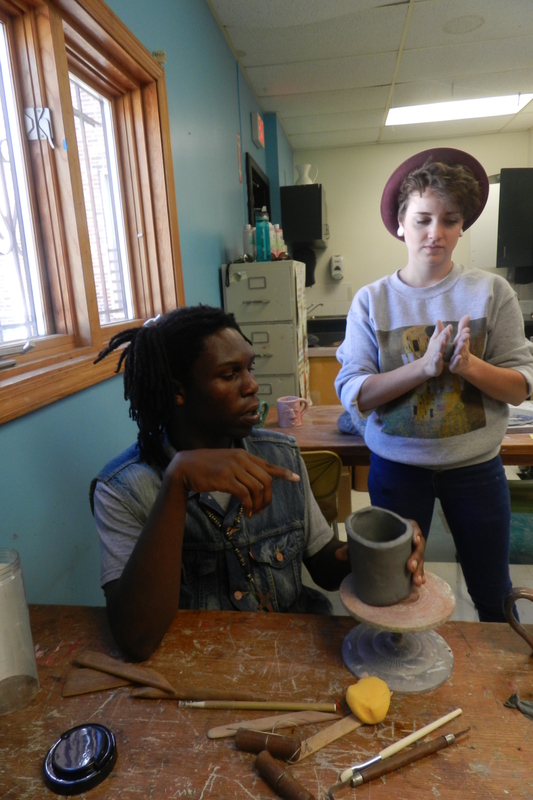 Aly King, a senior in ceramics at KCAI, explained the project and offered insight into the experience. She felt the experience was successful in multiple ways. The KCAI students opened the high schoolers’ eyes to art as something that can be pursued as a career, while the high schoolers showed KCAI students what its like to have your ideas interpreted through someone else. Altogether, the project was enriching for everyone involved. Keep an eye out for more updates on the happenings at DeLaSalle! ← More than half way there!